That anything as elegant as the Groma Kolibri should issue from East Germany is frankly astonishing. After all, the GDR spawned the Trabant, admittedly an exotic automobile, but nonetheless a travesty of German engineering. Such is not the case for the Groma Kolibri which, in some senses, surpasses other ultra-slim portables, though it does weigh a brick (this absolutely startled me when I got mine). Still, to possess a Kolobri is to own a museum-quality piece. Design-wise, however, the placement of the carriage return lever is an immense flaw. Note in the photos below (way below) the pit mark and scratch on the top left panel. The lever rests so low as to invariably scrape the panel; in fact, it is sometimes difficult to find one without this imperfection, though, ironically, this is part of its appeal: a graceful machine with a clumsy lever. Should you acquire a Kolobri, take care not to push down upon the lever as you draw the carriage. You must treat her delicately. I am tempted to add other Groma Kolibris to my collection, but they are pricey in today’s market. For now, one will suffice. The return lever is its only flaw. Mine has a very faint line across the ribbon cover where somebody lightly dragged the lever across it. Aside from that, it’s a gem. I’m a fan of Kolibris but agree about their Achilles’ heel. Originally, they came with a wedge of plastic stuck in the bottom of the return lever, which would prevent it from scratching. But this plastic has almost always fallen out. I recommend replacing it with some felt. Compared to my East German Optimas, the Kolibri really is amazing. Congrats on the acquisition. As for Trabants, the last ones I saw were flying above the stage at a U2 “Zooropa” show. ‘Tragic Beauty’ are the first words that come to mind. Ah, I envy you. I missed that tour due to a lack of funds (I was in college then). I barely scraped enough money together to buy Achtung Baby! What an extraordinary offering. I would have liked to have seen the Trabants in action! Yes, I stuffed some felt in the bottom of my return lever, and that supported the process. Thank you! Also, I think many of those scratches happen when the lid is not fully down, as it is easy to misalign even slightly, and then the tab release handle really scrapes it. 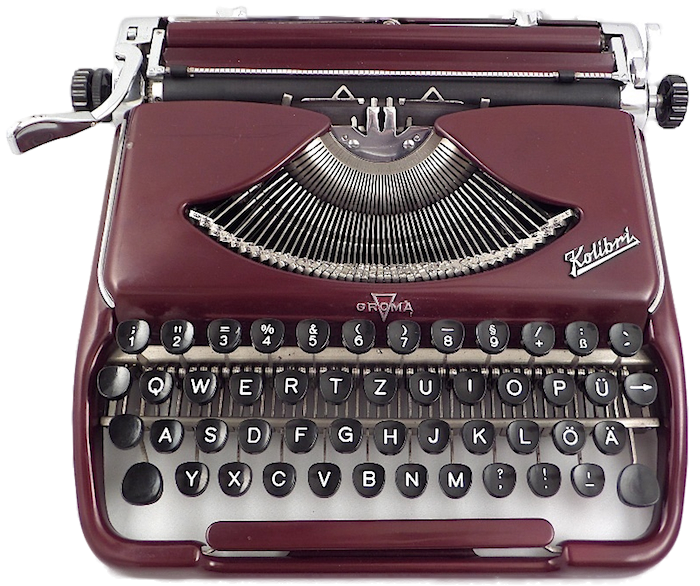 Another thing that I see as a slight curiosity as a writing instrument, is the lack of a tab feature on the Kolibris, particularly the machines from the 60’s. Weren’t tabs quite common then? Perhaps I’ve been sort of spoiled by my Lettera 32, which is quite portable, light, and has the simple to set tab feature, and the auto reversing ribbon mechanism. Even my Smith Corona from the 40’s has the tab. But yes, all different universes. I certainly marvel at the Kolibri’s beauty. Thank you for the post.